/ Ask a Dairy Farmer / Policies / I was recently told that all milk from Canada, regardless if it’s organic or regular, does not contain any steroids, growth hormones, or antibiotics. Is this true? Yes, that is true! Canadian milk, regardless of whether it is organic or conventional milk, undergoes strict milk quality production procedures and rigorous testing to assure that you have the highest quality milk to enjoy. If a dairy cow is being given antibiotics for an illness, she is temporarily removed from the milk producing herd and her milk is discarded. Once she has recovered and the antibiotics have cleared her system, her milk is again suitable for human consumption. All milk is rigorously tested for antibiotic residues prior to it being accepted at the milk processing plant. If milk contains traces of antibiotics, the milk is dumped and the producer is penalized. All Alberta producers participate in the Canadian Quality Milk program. This is a science-based, on farm food safety program that uses a preventative approach to minimizing food safety hazards. It helps to ensure the high quality of Canadian milk. Synthetic growth hormones to stimulate production are not legal for use in Canada. Check out Bea’s question and Nick’s question for more detail. 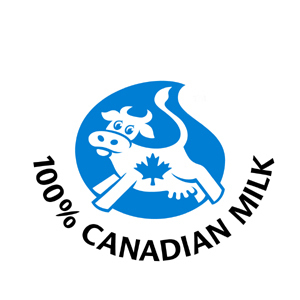 Furthermore, dairy products that carry the 100% Canadian Milk logo will only contain Canadian milk and no imported milk ingredients. Regarding steroids, these may be used by veterinarians to treat some dairy cow illnesses, such as milk fever and bovine ketosis, as well as used as an anti-inflammatory agent (like when humans use an anti-inflammatory medicine to reduce inflammation.) The prescription’s label explains the milk withdrawal times that must be adhered to before the cow’s milk can be used again. With organic and conventional milks, the only difference between the two is the way in which the milk is produced. Check out Trina’s question for more detail.